Flu Flus and Snaros Are in the air. The Snaro truly is the universal bird point. A Snaro works great on all sorts of small game such as squirrels, cottontail rabbits, snowshoe hare, upland game birds and any of the other varmints that might be destroying your yard or vegetable garden. The Snaro tipped arrow won’t be lost under the grass in the yard to never be seen again like a arrow with a regular field point. Even in the snow an arrow with a Snaro will be easily found and retrieved for your next shot opportunity. 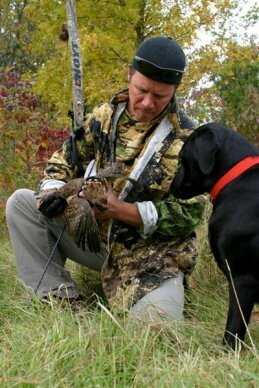 The Snaro really excels on smaller upland game birds and migratory game birds such as grouse and the American Woodcock when hunting behind a good pointing dog. With a bird that holds well on point in front of a well trained and disciplined pointing dog a archer has time to set his feet in the correct position for a good shot. At times a hunter can to some extent control the direction a bird will fly when flushed, greatly increasing the odds of success. Think a wild woodcock in flight is an impossible target with a bow and arrow? It is not, and Snaro will prove it to you. While the flying woodcock is a challenging target, with the Snaro and a good pointing dog you too can be successful. Practice with aerial targets for birds with targets that go up and straight away. Use some spiral fletched arrows from Snaro.net so that arrows aren’t lost in the distance, practice with a Snaro so that arrows aren’t lost in or under the grass, and practice a lot. A Snaro is tough enough to stand up to hundreds of shots, and hits hard enough to take down a woodcock for a clean kill.